A $100.00 dollar deposit is required for all bulk orders and will be applied to final total. Payment in full is required on delivery. A Whole Beef averages about 420+ pounds of Finished, Packaged, Boneless Beef. A Half Beef 200+ pounds, Finished, Packaged, Boneless Beef and, of course, a Quarter Beef weighs in at around 100+ pounds. We guarantee our steer butcher weight will be consistent with the yield, we leave very little to scraps and every ounce of every pound you receive is perfectly aged, juicy, tender beef with very little fat or cartilage/bone waste. All meat from slaughter and breaking to packaging is inspected and approved by the USDA. All of our meat is packed in Lincoln, NE at one of the most superior packers in the country. We pick it up and deliver it to you! We can assure you, even though its far away, we use this packer because a better one cannot be found anywhere! Their facility is immaculate and their cutting skill is perfection! *Custom Orders may take up to 6 extra weeks to receive because all of our meat is aged 35 - 56 days. Our Packer cuts and packages all the cuts of beef individually for you and grinds the ground beef and packages it in 1 pound packages, as well. Vacuum packing and flash freezing is standard for all of our beef. It will last in your freezer for 3-5 years without freezer burning, unless the seal gets broken. Below is a sample list of sizes of individual cuts and what variation of meats will come with a general cutting order. 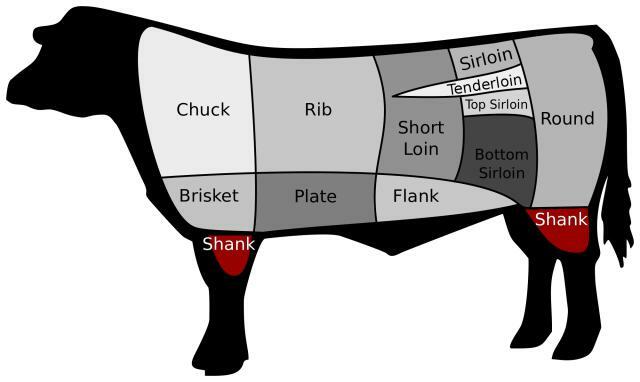 (The specific yield of each cut you will receive varies from head to head because each steer develops differently! And you're only charged for the pounds you get!) All the individually packaged cuts are listed below with the size they are cut. If you want thicker or thinner, less or more cuts, please contact us! We can add Special cuttings such as Philly Cheese Steak Meat, Prime Rib Roasts, Round the Bend Steaks, Ranch Steaks, Fajita Meat, Bacon Wrapped Filets, Hot Dogs, Oxtails, Tongue, Heart, Beef Jerky & others for NO EXTRA COST!!! Ask for Extras at time of order for Raw Beef Trim for dog food, Suet, and more! *May ot available for Halves and Quarters. We understand that we may be a little higher priced than other sources. This is because we follow a very strict Natural Program, overseen by the USDA. We are not just backyard growers who do not administer antibiotics, also, we are not commercial growers. We understand we cannot match Costco's price, but we are 100% dedicated to the idea that pure, flavorful, perfectly marbled and aged beef can be produced without an outrageous price tag. Although, following a Natural Program start to finish requires a lot of time, effort, paperwork, and attention to detail. To be able to guarantee the origin, quality and health of every calf, start to finish, is something we are VERY proud of. Almost ALL of our beef grades High Choice to Prime! And that is all we sell. If it doesn't grade, we don't sell it. It's that simple! And that's our promise!